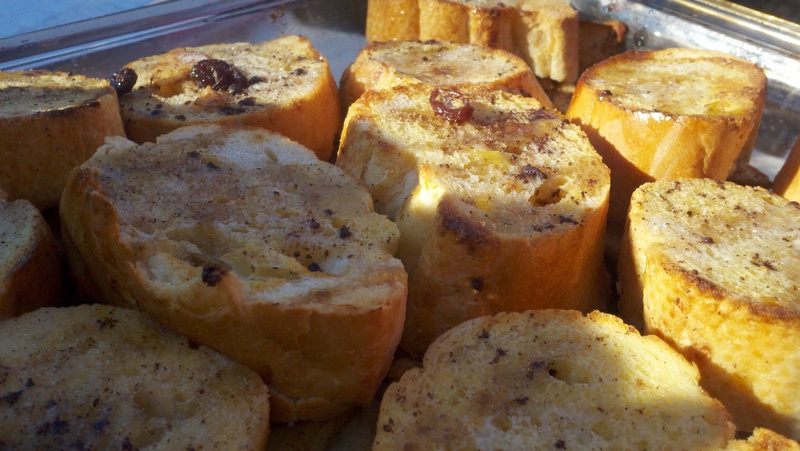 This Overnight Stuffed French Toast made its appearance the morning after this years bonfire. Expecting a crowd of about 150 people, lots of booze, and a band jamming into the morning hours, I knew we would end up with some overnight guests. I prepared this French Toast along with an Egg Strata the day before, then when morning came simply popped them in the oven and in about 30 minutes breakfast was ready! That 30 minutes gave us just enough time to pour some Mimosas and mix up some Bloodys :) Thanks to all who helped us out with the party and to those who returned the next morning not only for breakfast but to help clean up. We ended up needing a Clean-Up party for the Clean-Up party but that’s OK lol. Slice french bread into rounds that are about 1 inch thick. In a bowl, toss apples with raisins and brown sugar to coat. To stuff the french toast place a scoop of apple mixture between 2 rounds of french bread as if you were making a sandwich. Then place each into a large casserole dish (13×9.) In a separate bowl, whisk the eggs, half & half, and cinnamon. Pour over all the pieces of stuffed french toast in the casserole dish, being sure to coat all surfaces of the bread. You may want to flip each to really get them well coated. Smear a pad of butter on top of each. Cover and refrigerate overnight. Bake at 350 for about 30 minutes. Drizzle syrup on top and serve extra along side. Making your recipe tonight for Thanksgiving breakfast! Making your recipe tonight for Thanksgiving breakfast!! !